Wetness on your baby's skin could disturb her sleep. New Pampers Active Baby helps to keep your baby dry for up to 12 hours of Golden Sleep. That's because it has new extra absorbing zones which absorb wetness faster than before. 1 Pampers = 1 dry night. Keep your baby's skin delicate with 5 star skin protection. 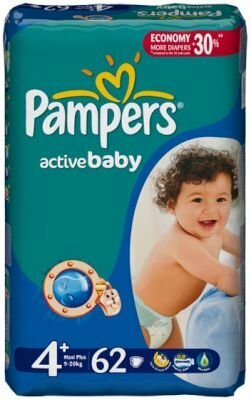 Pampers Active Baby comes with 5 features in just one diaper. 12 Hours Dryness Our driest diaper keeps baby's skin touchably dry for up to 12 hours. Baby Lotion This unique diaper is infused with baby lotion to help prevent diaper rash. Cottony Softness Keep baby's skin free from irritation with cotton-like softness. Breathable Cover Air circulates so baby's skin can breathe easily and stay wonderfully fresh. Comfortable Fit A flexible. side stretch design keeps it snug and comfy whether baby is at rest or play.